A Chinese firm's bid to buy the gas-guzzling Hummer car brand will be blocked on environmental grounds, according to Chinese state radio. But China National Radio said Hummer is at odds with the country's planning agency's attempts to decrease pollution from Chinese manufacturers. But Sichuan Tengzhong disputed the accuracy of the radio report. "The fact that it is from an article from a state media organisation does not mean it is government policy," the company said in a statement. "Some people may have views and speculation, but the Chinese government has a process that we respect." The value of the bid was not disclosed at the time, but analysts say that GM would have made about $100m (£61m) from the sale. National Development and Reform Commission (NDRC) will also block Sichuan Tengzhong from buying Hummer because the Chinese construction equipment maker lacks expertise in car production, the state radio added. Sichuan Tengzhong said: "The view expressed on China National Radio's website did not quote or source anyone at NDRC." "We do not yet have a definitive agreement, but are developing our proposals with GM and Hummer and we will continue to engage with the appropriate authorities in an appropriate manner." Hummers were originally built as military off-road vehicles by a company called AM General. 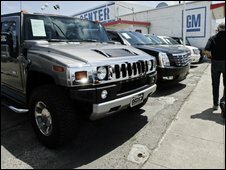 GM bought the Hummer brand in 1999. The brand took off as US consumers flocked to large cars and sport utility vehicles and were favoured by celebrities including Arnold Schwarzenegger. But sales have suffered as the military image has become less popular and petrol prices surged. Hummers weigh up to five tons and have fuel consumption of around 15 miles per gallon. The sale of Hummer, known as "Han Ma" or Bold Horse in China, has been part of GM's plan to reinvent itself by concentrating on fewer brands.